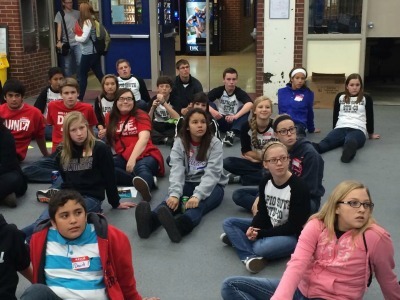 The first ever Project Unify Youth Summit was held at the University of Nebraska at Kearney on November 8th. Over 70 high school students from 13 schools came to Kearney to learn more about how they can implement Project Unify at their school. To start the day off every student attending stood and took the pledge for Spread the Word to End the word, then heard a speech from Jason Sharp. His message to students was to never judge someone by what you see on the outside. No disability, physical appearance, or social class can define what a person is capable of accomplishing. Students then split out into mini sessions. Some of the presentations include: Deb Schauer who came and demonstrated games and activities that students could play with Special Olympics athletes, Camie West of Special Olympics College did a presentation on activities and games as well. Trooper Jeff Boston came and spoke about the events that Special Olympics offers like the Torch Run, Healthy Athletes, and the Polar Plunge. Dr. Donna Montgomery showed students how to make friends with people who have different levels of disability. And Special Olympics Nebraska Director of External Relations, Sandi Hansen presented about professionalism on social media. The part of the day that students enjoyed most was the Olympics held at Cushing Coliseum. Each team had a member of the local Kearney Special Olympics team that participated in games right along side students, games ranged from trivia quizzes to stuffing balloons into oversized track suits! To end the day Mike Smith Live, founder of the Bay and Harbor TV, spoke to the students about small acts of kindness and how the ones that go unseen are the ones that make the most impact on a person. Overall the Youth Summit was a success, many students left excited to implement Project Unify at their school and were eager for another chance to learn about Special Olympics and Project Unify!